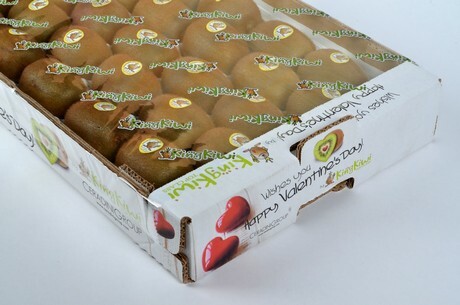 Massimo Ceradini from Kingfruit in Verona confirms that kiwi prices are still not very profitable this year. "We sell 90% of the produce abroad and we noticed prices are not high. We work a lot, but there is little margin. We are in competition with Greece, Turkey and Iran, so it is not easy." Ceradini stresses that, every year, there are more and more certifications to obtain, parameters to comply with, residues to check, eco-friendly packaging to introduce. Nonetheless, prices are not increasing: "they demand more and more from us, but they are not willing to recognize our work and that of our producers." Ceradini Group will attend Fruit Logistica in Hall 2.2., Stand A05. "We work all over the world, so we will attend the fair in Berlin to meet our many clients and strengthen our trade agreements." The group will also present its new packaging dedicated to St. Valentine's Day. After the great feedback of two years ago, the design will be used once again: many red hearts surrounding the green flesh of a fruit with a heart-shaped red center. What is more, Sav1 rootstocks have been greatly improved. "We aimed at solving various problems linked to the soil, especially those caused by the lack or abundance of water. It is something entirely new for our hemisphere and, so far, results exceeded our expectations. New Zealand started testing it 16 years ago and the rootstock has been largely used for the past 6 years with excellent results."